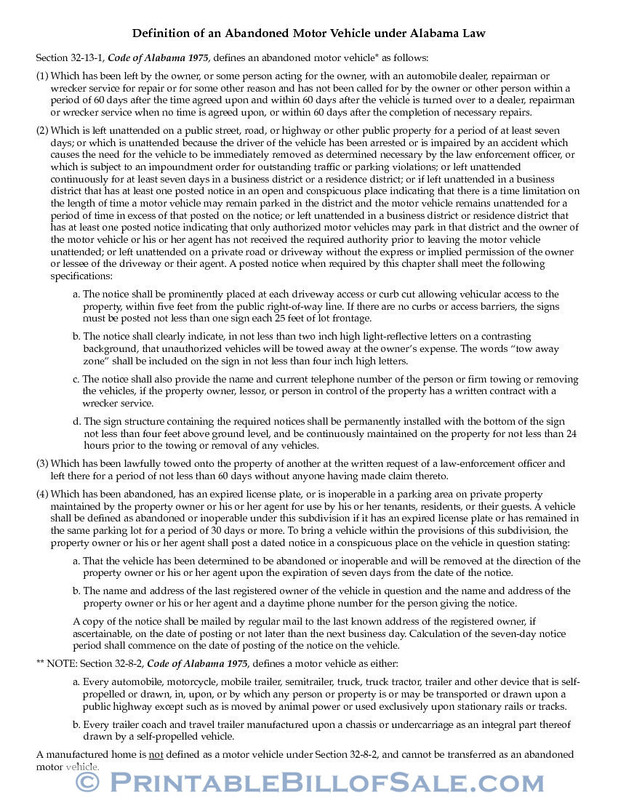 MVT 32-13B is a form intended to facilitate the legal sale of an abandoned vehicle. Title 32, Chapter 13, Code of Alabama 197 govern such sale process. This transaction must be pursuant to directives mentioned in Section 32-13-4, Code of Alabama 1975 and Form MVT 32-13R, Abandoned Motor Vehicle Record Request Response. Please read the provisions carefully to understand the definition of an abandoned motor vehicle and the possible causes. This transaction must comply with the requirements of publishing notices. Alabama State is the jurisdiction of executing this bill of sale form. 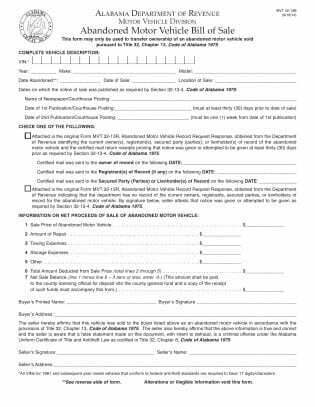 MVT 32-13B Form has three main parts requiring various inputs about the motor vehicle, financial transactions, and signatures of buyer and seller. However, if any of the statements are false you may have to face court proceedings as prescribed in the Alabama Uniform Certificate of Title and Antitheft Law governed by Title 32, Chapter 8, Code of Alabama 1975. 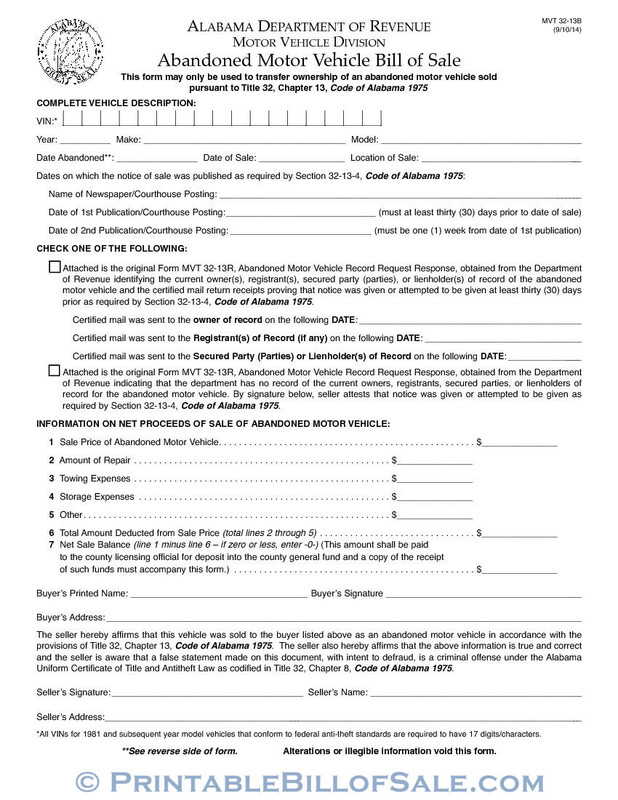 Enter Vehicle Identification Number on the first line of MVT 32-13B Alabama Abandoned Motor Vehicle Bill of Sale form. This VIN must contain 17 digits if the vehicle manufacturing year is 1981 and above. Then enter the year of manufacturing, make of the motor vehicle, and model on the respective lines. You must enter the date abandoned in line with the directives mentioned by the Alabama Department of Revenue of the Motor Vehicle Division. Provide the date and location of the sale on the respective lines. Section 32-13-4, Code of Alabama 1975 has directives for publication of notices. Enter name of Courthouse / Newspaper posting on the next line. Then mention the first and second date of Courthouse posting or publication of the notice. Please ensure to keep an adequate gap between these two postings as mentioned in form MVT 32-12B. Please check one box related to Form MVT 32-13R and provide dates for sending certified mail to the owner of record, Registrant(s) of Record, and Secured Party (Parties) or Lien holder(s) of Record if you select the first box. Enter buyer’s printed name, signature and address in the respective lines. The seller must agree to meet the directives prescribed in Title 32, Chapter 13, Code of Alabama 1975 under the perjury of penalties as codified in Title 32, Chapter 8, Code of Alabama 1975. Then enter seller’s printed name, signature, and address on the spaces reserved for the same.